It just isn't appropriate to bring your personal assistant home with you, but Zaojun doesn't mind. 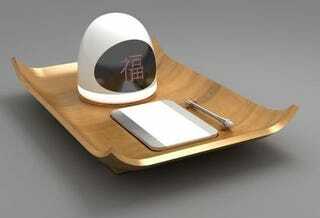 The concept Wi-Fi gadget can do lots of things, including read you your email, messages and be programed to turn on appliances. It appears that Zaojun would have a tactile surface which you can rub to turn it on (yes, lewd joke intended). According to the designer, the receiver is made out of a Kevlar membrane which allows it "to answer your calls or listen to music." I also assume the integrated Bluetooth helps with this. You should be able to control the guy remotely with its router of sorts. It has some wireless charging capabilities, too.